DPFR News - there is a most regrettable omission on Pages 4/5, of Achievements. How could we possibly ignore (I put it down to my senility..) Joe Blackett's placing of 1st MV50 in the BOFRA Championships, and especially the huge amount of travelling and committment involved. 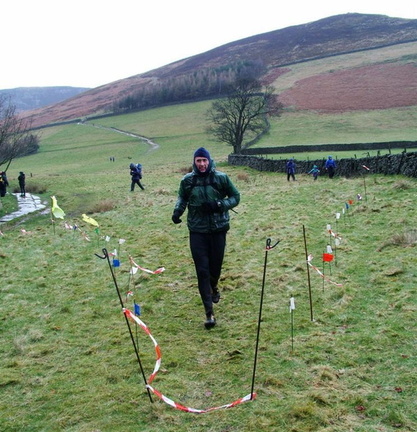 Black Combe - English Championship 1 - results Well! The clag was down, and many runners seem to have gone badly astray. Reaching the CP after White Combe has caused problems, as also has the line off the final CP. Ben Mounsey was first, then Kris Jones and Rhys. Tom Brunt - 3rd MV40 - and Tom Saville - 2nd MU23- counted to take 1st team, ..Not a clue about the V40 team, but V50's were strong, Dave Taylor - 2nd MV50 - , Stephen Pyke - 3rd MV50 - and Joe, with Steve Bell getting in amongst any other counters. For the Ladies, Victoria Wilkinson was far ahead, but we only seem to have Kirsty and Ellie - well up in the LU23 group - running. Any better news most gratefully needed..
Haworth Hobble:- results .Apologies for missing Peter Eccleston off the results, should be getting sorted out. Edale Skyline, and not to be forgetting Don Morrison.